Frothy will donate up to 8,000 slabs to local footy clubs across Victoria next week in the Frothy For Footy giveaway. 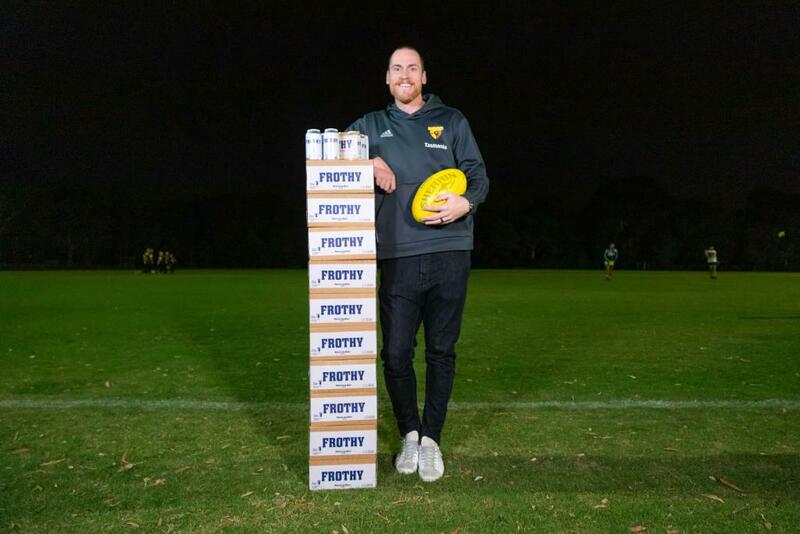 Jarryd Roughead, as Frothy’s new Head of Sponsorship, will help co-ordinate the massive pick-up efforts at 15 sites across the state on Wednesday, 17 April. Every footy club in the state, with a senior team, can participate. To register to pick-up the free beer, club representatives should click here: www.grabafrothy.com.au. Registrations close Sunday, 14 April. Roughy said: “Footy and Frothies are a fantastic combination. “Local footy is the backbone of our great game so we want to give local clubs the chance to raise some money off the back of this great tasting beer. “This is a great way to help local footy clubs raise some funds. “Clubs register online. They then just need to drive to the pick-up site to collect their club’s free beer – up to 15 slabs each. Frothy is a product of craft-brewing pioneers Matilda Bay, which is part of the Carlton & United Breweries stable. The Frothy for Footy giveaway is part of Frothy’s takeover of the AFL and NRL for one week only this week. This will see Frothy put on tap at the MCG, Marvel Stadium and GMHBA in Geelong and Carlton Draught and VB signage replaced with Frothy marketing across the country. Pick-up sites will stretch from Mildura in the state’s north-west to Warrnambool in the south, Morwell in the east and a dozen places in between. Frothy is made from 100% Australian hops and barley and has proved a hit with consumers since it launched last September. Free beer will only be given to club representatives who pre-register. These representatives must be 18+ and valid ID is required at pick-up.